Tony C. Jones represents businesses and individuals in a wide array of commercial, tort and insurance litigation matters. The diversity of Tony’s practice has afforded him the opportunity to represent entrepreneurs, franchisees, closely held and family-owned businesses, healthcare companies and professionals, trucking companies, property management companies, hotels, restaurants, real estate developers, construction companies, technology companies, and insurers in all phases of dispute resolution. Tony is well regarded for his work in the Atlanta community. Tony has been selected for, and is a member of, Outstanding Atlanta and LEAD Atlanta. 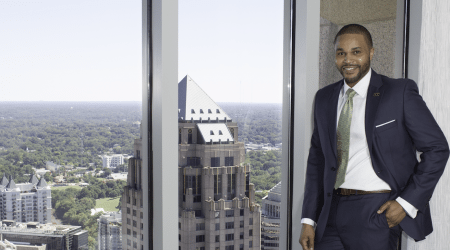 He serves as the President of the Emerging 100 of Atlanta, a Board Member on the American Red Cross’s Minority Recruitment Advisory Board, and is a Founding Board Member of the Resurgence Hall Charter School. Tony is the inaugural recipient of the Terrell J. Slayton Member of the Year Award from the Emerging 100 of Atlanta. In 2014 and 2016, Tony was recognized by Who’s Who in Black Atlanta as a Counselors at Law Section Honoree. Tony was named Super Lawyers Georgia Rising Star 2017. Prior to joining Galloway, Johnson, Tompkins, Burr & Smith, Tony worked with both regional and international law firms in complex commercial litigation and tort matters. The breadth of Tony’s practice and his depth of experience have made him a sound advocate in any dispute, big or small.